Race can be an awkward topic of discussion, especially if raised by a Black person. In this instance, some people can interpret the topic as a personal attack, i.e. Jeanne Beker versus Jully Black on the finale of Canada Reads 2018. 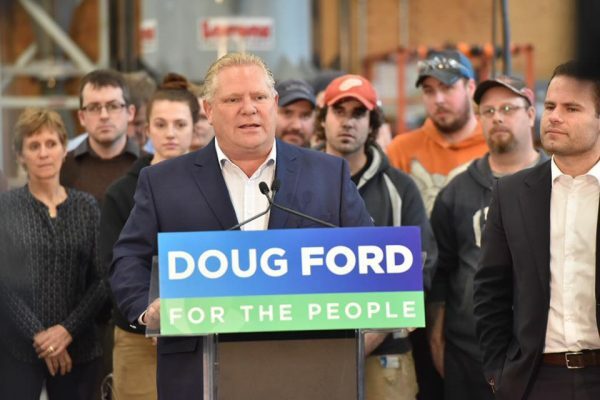 When it comes to Ontario Progressive Conservative leader Doug Ford, it is impossible to ignore how race, especially his, will factor into his quest to take charge of the largest province in the country. Some of Ford’s comments vis-à-vis himself and Black people have many wondering if he has a “white savior complex,” commonly defined as a white person who perceives non-white people as being unable or incapable of helping themselves without the benevolent assistance, financial or emotional, of a white person. When a supposed scheduling conflict prevented Ford from attending the first-time-ever Black community debate recently hosted by the Jamaican Canadian Association, his comments to reporters signaled that he just might be afflicted with this complex. These comments spoke to Ford’s avoidance of the Black debate, but they also referred back to a failed 2013 publicity stunt where Ford showed up at a Toronto Community Housing building to hand out $20 bills to mostly Black residents for Christmas. Ford has also suggested that if it wasn’t for him and his late-brother/former mayor Rob, groups of Black kids from Rexdale would never be able to head up north to his cottage to dip their toes in water. And yet, despite all of this, and hints that he would bring back TAVIS, the Toronto Anti-Violence Intervention Strategy, that was abandoned last year because of carding, a known anti-Black practice, there are still members of the Black community in Etobicoke North, but also Scarborough and the 905 suburbs, who absolutely love Doug Ford. One of the reasons why his white saviorism is so hard for people to see, recognize, and call out is because we have been conditioned to view Black people as collectively incapable of self-help, especially the ability to lift one’s self up from under the rungs of poverty and even violence. In turn, those who manage to “beat the odds” become exceptions to this rule. Beginning in the nineteenth century, travel writers, abolitionists, and missionaries helped to entrench the narrative of Black helplessness. Specifically, most scholars point to Harriet Beecher Stowe’s 1852 novel Uncle Tom’s Cabin as having one of the most significant roles to play in sanctioning the white savior mythology. The novel’s two conflicting narratives – slave escape and martyrdom – both centralize the narrative of Black devotion and indebtedness to whites. Eliza, a fugitive slave who escapes with her young son over the ice floes on the Ohio River, is depicted as only being able to gain her freedom through the help of northern abolitionists. Marcus Wood, a professor of English at the University of Sussex, asserts that the narrative death of the Christian martyr has helped to confirm a belief that Blacks can only successfully interact with whites after conversion to Christianity, and as such, early British missionaries would give special emphasis to the position of the emancipated Christianized slave who dedicates his or her life to missionary work, especially in Africa. Even the British travel writer Amelia Matilda Murray, who travelled throughout Ontario in the 1850s, believed that freedom would never make the Black population “anything more than a set of grown-up children,” a comment she penned in her 1856 travelogue, Letters from the United States, Cuba, and Canada. Thus, the narrative of Black people as either in need of saving or simultaneously only capable of salvation through the help of a white savior has never left the collective imagination. The Kony 2012 debacle is a contemporary example of this trope. While Mayor John Tory doesn’t exactly have the greatest track record on race, he has at least demonstrated an ability to evolve as far as race is concerned. But since then, he has changed his tune. Last year, he spearheaded a nearly $1 million budget request for a 22-point plan called as the Toronto Action Plan to Confront Anti-Black Racism. On the first page of that document Tory writes, “Anti-Black racism exists in Toronto.” While this could be a purely symbolic gesture, it is an acknowledgement that nonetheless shows that, irrespective of party affiliation, it is possible to address issues of race and racism on a structural level, as opposed to merely gesturing at press conferences or media events. For all his talk on behalf of Black people – Ford is one press conference away from revealing an old “Black friend” – there is little evidence that Ford Nation has done anything to further the cause of Black empowerment. Ford’s modus operandi might be white savior but he isn’t even getting that right at the moment. Cheryl Thompson, a 2016-2018 Banting Postdoctoral Fellow at the University of Toronto, is currently working on an Uncle Tom’s Cabin as visual culture book project. Follow her on Twitter at @DrCherylT.